For those of you who may not be aware, today marks the start of Kindness Week in Ottawa. I think nothing can be kinder than to acknowledge the incredible services and support The Youville Centre offers to young mothers and their children. The Youville Centre is a charitable organization that offers a high school education and so much more to teen mothers in the Ottawa community. Last month, myself and several other Ottawa women bloggers were provided the opportunity to tour the Centre and learn all about what they do. To help these young mothers finish high school, The Youville Centre offers daycare and child development programs so that these moms can attend classes knowing their children are well cared for. The Centre also offers student support programs such as: lifeskills training, parenting courses, breakfast and lunch, housing support, counselling, and a whole lot more. I expected that I would be impressed by what I would see and learn during the tour. And I was. What I didn’t expect was that I would have such an emotional reaction to the experience. I was doing okay up until about 5 minutes into the tour. That’s when the door to room we were in – a sort of common room used for graduation ceremonies and other activities – suddenly opened and a group of toddlers and their caregivers streamed in. Amidst the sound of little feet running full-tilt and shrieks of laughter, I lost it. For the rest of the 1-hour or so tour, I really had a hard time keeping back the tears. It’s not because what I learned during the tour was sad. While many of the teens who attend school at The Youville Centre face difficult life circumstances, the Centre provides an extremely positive and enriching environment. For both the students and their children. No, the reason my reaction was so emotional is because I was the child of a teen mother. I know how hard my mom struggled to provide for us. And I know what it was like to feel just a little bit on the periphery of society. Judged a little bit less-than. My mom eventually got her high school equivalency. She attended college, worked hard and taught us the value of an education. But back in her day, being a single mother – let alone a teen mother – was frowned upon. I think that if my mom could have accessed this kind of support, she wouldn’t have felt so isolated at times. This year, The Youville Centre lost a funding source they have had for a number of years. This means the Centre is short $40,000. The Centre needs this funding to pay the salary of a front line worker whose job is to counsel students, liaise with the Childrens’ Aid Society, Housing Ottawa, and do a multitude of other things. This person’s job is in jeopardy as the Centre has not been able to make up for this funding loss. If you’re interested in helping, then please click the Canada Helps button below. Any amount you can give is appreciated. Your donation will impact the lives of two generations by helping ensure the Centre can continue to offer needed support to these students and their children. I’d like to thank Candace Derrickx (@seemummyjuggle) for arranging the tour, and Youville Centre employee Heather Heagney (@YouvilleCentre) for providing such a great overview of the many services and support programs the Centre offers. To coincide with Kindness Week, Candace organized a blog carnival where all of us who who participated in a tour of The Youville Centre are sharing our experiences. Visit Candace’s blog for the full list of participants. There are plenty of reasons to be kind to each other. Not just this week, but the whole year through. So go on and pay a kindness forward and celebrate the good things and people in your life. 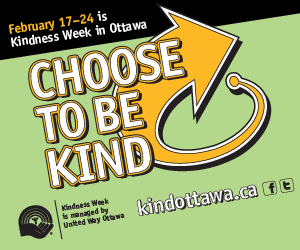 For more information about Kindness Week in Ottawa, follow @KindOttawa on Twitter or visit their Facebook page. thanks for your kind words and for donating! The Youville Centre IS awesome! Thank you, Mel! What a beautiful, heartfelt post. We are so touched that our cause resonated with you on such a personal level and we are so proud of your Mom for being able to navigate the challenges of teen motherhood without supports like the services we provide at Youville Centre. We are so lucky to have women in the community such as yourself who understand and support our efforts to help our young clients and their children. Thank you for spreading the word and thank you to all who donated because of your powerful words.